You’re getting married! While the love you share is the best way to express how much you care about each other, it never hurts to say “thank you” every once in a while. On the day of your wedding, show your fiancé how much you appreciate him/her with a small gesture of gratitude, whether it’s a handwritten note or a secret surprise at the reception. Here are 6 ways to give thanks to your better half for sticking by your side, for better or for worse. 1. Write each other notes. Sure, a sweet “can’t wait to see you!” text is nice, but there’s nothing quite like a handwritten note to express how you truly feel. 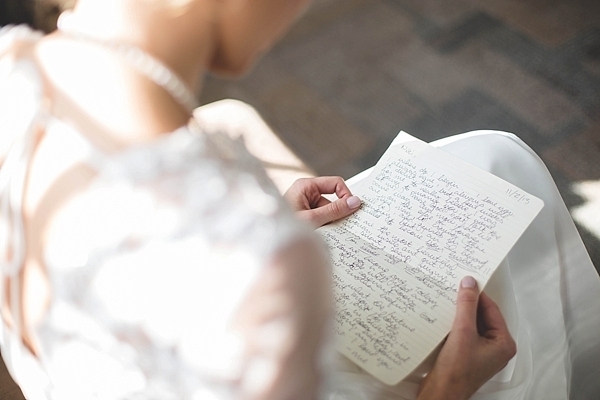 Talk to your partner before the big day and make a pact to write a note on the morning of your nuptials to capture how you feel about each other in that very moment. Have your photographer (or better yet, your videographer) capture each of your reactions on film. You’ll get some great, heartfelt photos! Plus, the notes make for great reading on your anniversary each year. 2. Give each other a small gift. You’ve spent months gathering thank you gifts for everyone who made your wedding possible, from your bridesmaids to your mom and even your ring bearer, so don’t forget to get a little something for your fiancé as well. It doesn’t need to be anything big or expensive, but show him/her how much you care with a small token of appreciation. 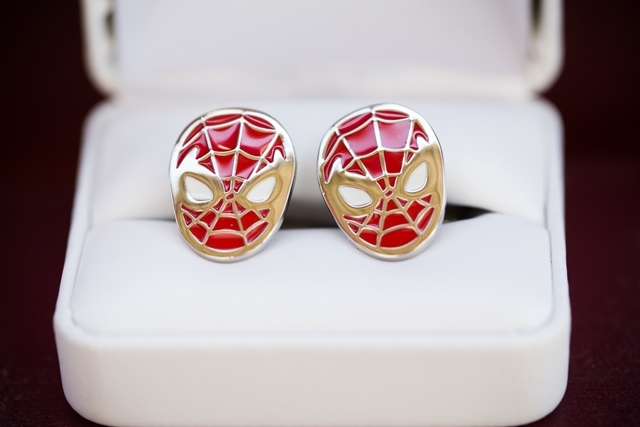 Did he really want spiderman cufflinks but couldn’t find them? Make sure you find something suitable. Did you save the menu from your first date? Have it framed. Take the time to do your research and gift your love with something sentimental and thoughtful on the morning of your wedding. It will help get the day started off on the right foot! 3. Add a special message to your rings. 4. Unveil a fun surprise at the reception. Is your spouse-to-be obsessed with sports or the Great Gatsby? Give a nod to his/her passion with a small display at the wedding. Have guests type notes on a vintage typewriter or ask your baker to make up a special groom’s cake with your fiance’s favorite team’s logo on it. Keep it a secret until the day of the wedding to really up the wow-factor! 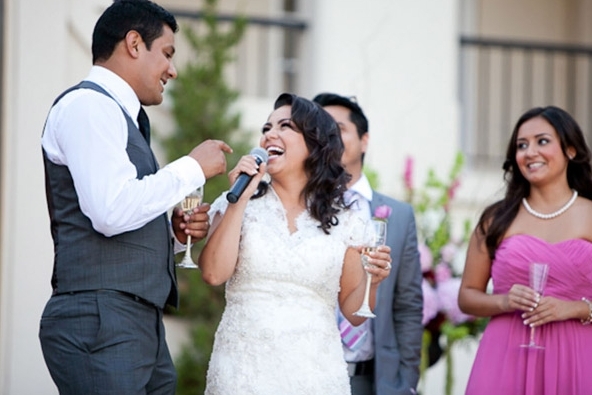 While not every bride and groom feels comfortable professing their love in front of ALL their family and friends, a speech at the reception is a nice way to publicly acknowledge all your new spouse has done for you over the years. Tell the story of something your partner did that helped you realized you found THE one (perhaps he/she helped you through a hard time) or keep it short and sweet with a sincere “thank you for EVERYTHING.” Either way, your partner will appreciate the words of, well, appreciation. 6. Steal a moment away together. 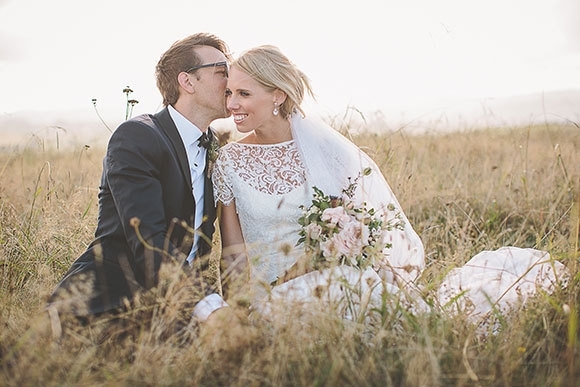 Don’t let your wedding day go by without savoring a quiet moment together. After all, your wedding is supposed to be about the two of you! Sneak away after the ceremony for a private kiss as newlyweds or sit at a sweetheart table so you can breathe, eat, and take in the scene. Whatever you do, take time for each other in the midst of all the wedding day excitement. When you see the giddy look on each other’s faces, you’ll be glad you did.